For Brits like myself, 2016 got off to a decidedly queasy start, with the extraordinary proclamations of the UK’s Department of Health as it released new, draconian guidelines for alcohol consumption. Let’s begin 2017 on a more positive note, ignoring for a moment the various political calamities on both sides of the Atlantic. 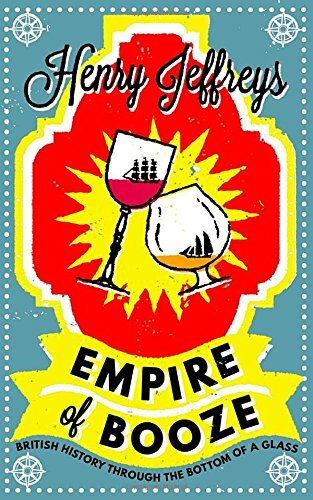 The UK has always had a slightly dysfunctional, polarised relationship with the demon drink, but Henry Jeffreys has shown us the positives in this wry, eminently readable first book “Empire of Booze“. The concept is original, and like so many of the best ideas, so disarmingly simply that you wonder why no-one else has ever come up with this analysis before: “If not for Britain, most of the world’s favourite drinks would not exist… Not even the French ones”. Think about it – Port, Madeira, Marsala, Claret, Champagne – all were either invented in their modern form by Brits, or at the very least popularised by them. Gin, Rum & Cognac (somewhat tenuously) are also here added to the list. Jeffreys has form, not just from his excellent blog “Henry’s World of Booze“, and writing gigs for The Lady and The Guardian, but also as a former contributor to the inspired “London Review of Breakfasts” (He was Blake Pudding, in case you wondered). His quietly witty prose is the perfect foil to a book which is surprisingly dense with facts, historical asides, tales of gruesome slavery and bygone captains of industry. The explorations of Champagne and Port in particular have a level of detail that is, to me at least, quite fascinating. Who knew that it was the invention of a strong enough glass bottle that proved much more important in the development of Champagne than the method of producing the bubbles? The Dom Perignon legend is of course rightly debunked. Jeffreys explores the true nature of Gin palaces in 18th century London – it wasn’t pretty, they were the alcoholic equivalent of Chicken Cottage (a budget fried chicken takeaway in the UK), and also unravels the myths surrounding the “India Pale Ale” style of beer. There is much debunking, and a certain grim realisation that many of our favourite drinks were born out of cheap slave labour and other humanitarian abuses. The etymological origins of everything from “Navy Strength” to “Rum” and “Porter” are revealed along the way. Structurally, the book exposes its origins as a series of magazine and/or blog articles, with occasional repetition (why two separate chapters on Champagne?) and some odd, cursory deviations to muse on the wine industry’s love of red trousers or America’s love of ice, to name two. The text is occasionally clumsy and erratic, with the odd garbled sentence, which makes me suspect that Unbound ought to spend more on their proof-reading team. Maybe they just sampled too many of the book’s subjects along the way. It is striking that this book could not have been written about any other nation. The UK may have retained a rather uncivilised Anglo-Saxon attitude to its booze consumption, but could certainly not be accused of lacking in variety. Most other great nations run on one liquid, and one alone – Vodka for Russia and Poland, Wine for France, Beer for Germany. And the US? Diet coke, perhaps? Joking aside, “Empire of Booze” is that very rare beast – a non-fiction book written largely about wine (or wine-derived alcoholic drinks) that manages to be witty without being contrived, accessible without talking down to anyone, and educational without being preachy. I’ll raise my glass to more of that in 2017. Empire of Booze is published by Unbound and available from Amazon ($32.95) and other retailers worldwide.